Grease: The Original Soundtrack from the Motion Picture is the original motion picture soundtrack for the 1978 film Grease. It was originally released by RSO Records and subsequently re-issued by Polydor Records in 1984 and 1991. The song "You're the One That I Want" was a US and UK No. 1 for stars John Travolta and Olivia Newton-John. It's sold over 38 million copies worldwide.Making it one of the best selling albums of all time, also ranking amongst the biggest selling soundtrack albums of all time. 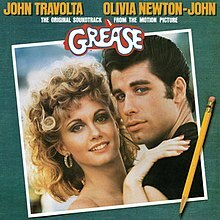 Besides performers John Travolta and Olivia Newton-John, the album also featured songs by rock n roll revival group Sha Na Na as well as the hit song "Grease", a tune written by Barry Gibb (of the Bee Gees) and sung by Frankie Valli (of The Four Seasons) that was an additional U.S. number one. The soundtrack was released in April 14, 1978, two months ahead of the film's release. As with most musicals of the period, the vocal takes recorded for the album release - and in some cases the instrumental background as well - do not lock to picture but were recorded during entirely different soundtrack sessions often months prior or subsequent to the performances used for lip sync in the film. The cover gives credit to, and prominently features, the two stars of the film—John Travolta and Olivia Newton-John—although they only appear on seven of the 24 tracks. Sha Na Na performed many of the 1950s numbers in the film, the recordings of which also appear on the soundtrack. Stockard Channing sings lead on two of the tracks; the two tracks remain her only significant contribution to recorded popular music to date. The title track was recorded by Frankie Valli, who had no other connection with the film. The entirety of the score written by Jim Jacobs and Warren Casey for the original musical was included on the soundtrack and/or in the film, with the exception of two songs: "Shakin' at the High School Hop" (originally composed to open Act II of the musical) and "All Choked Up" (the song originally written into the spot where the film used "You're the One that I Want") were both left out of both the film and the soundtrack. Not all of the songs were included in the film; songs cut from the film were performed on the soundtrack by Louis St. Louis and Cindy Bullens or converted to instrumentals. Songs in the musical that were not performed by Rizzo, Danny, Sandy, or Johnny Casino & the Gamblers were given to those characters or to St. Louis and Bullens; these included Sandy's original feature number "It's Raining on Prom Night" (given to Bullens and used as a jukebox background song), Marty's "Freddy, My Love" (given to Bullens), Doody's "Those Magic Changes" (given to Johnny Casino & the Gamblers), Kenickie's "Greased Lightnin'" (given to Danny), and both of the songs originally attributed to a character named Roger that was written out of the film, "Mooning" and "Rock'n'Roll Party Queen" (both given to St. Louis; "Mooning" was replaced in function in the film by the 1930s standard "Blue Moon," performed by the Gamblers). The most successful songs from the soundtrack were written specifically for the film. They included the Billboard number-one hits "Grease", "You're the One That I Want" and the number-three, Academy Award-nominated "Hopelessly Devoted to You". In the UK, the album proved even more successful where "You're the One That I Want" and "Summer Nights" (a song carried over from the original musical) reached No.1 for nine and seven weeks respectively, while "Grease", "Hopelessly Devoted to You" and "Sandy" all became top three hits. The soundtrack album hit the top of the charts in the U.S. during the summer of 1978, replacing The Rolling Stones' Some Girls. In the UK, it remained at the top of the charts for 13 consecutive weeks. As of 2011, "You're the One That I Want" and "Summer Nights" are still among the 20 best-selling singles of all time in the UK (at Nos.6 and 19 respectively). "Greased Lightnin'," another carryover from the stage version, was also released as a single, reaching the top 20 in the UK but narrowly missing the top 40 in the U.S. in part because of the lyrical content not being permitted on U.S. radio. Two of the bass players who recorded on the Grease soundtrack were (at different times) members of Toto. One of these, David Hungate, also performed on Olivia Newton-John's album Totally Hot with Toto guitarist Steve Lukather. Other musicians here have previously worked with Elton John, Steely Dan, Bee Gees and others. The Grease album as well as the soundtrack for the film were recorded and mixed by David J. Holman. The album has sold over 6 million copies in the US in the SoundScan era (beginning 1991) in addition to the 8 million shipped in the years 1978-1984. Stephen Thomas Erlewine of AllMusic retrospectively rated the soundtrack four-and-a-half stars. He stated that "the originals hold up better than the '50s tunes", but that they "are so giddily enjoyable that everything works". He also said that "the sleek pop production the movie's soundtrack boasts and the cast's enthusiastic performances go a long way in making this Grease the definitive Grease." The album was nominated for Album of the Year at the 21st Annual Grammy Awards. The CD of the soundtrack has been released twice in the US. In April 1991 it was released through Polydor Records as a single disc replicating the sequence of the original 1978 RSO LP. In September 2003 it was released by PolyGram as a 2-CD digitally-remastered "Deluxe Edition" containing additional tracks. As with the LP and single-disc CD, the songs are not presented in the order replicating their appearances in the movie. 40th anniversary vinyl reissue In August 2018, Polydor reissued the vinyl album to celebrate its original release in 1978. Released on 180g vinyl and mastered in half speed, it was the first time since its original release that it had used the original RSO record label in the artwork. No information was provided on who or where the record was half speed mastered. Saxophone: Ray Pizzi ("We Go Together" & "Greased Lightnin'"), Ernie Watts ("There Are Worse Things I Could Do" and "Alone at a Drive-In Movie"), Jerome Richardson, John Kelson, Jr. Photography: Alan Pappe/Lee Gross Assoc., Inc.
+Does not include sales from November 7, 1984 through March 1, 1991, the dates between the album's last certification and the date Nielsen SoundScan began tracking album sales. ^ a b Fong-Torres, Ben (October 5, 1978). "Al Coury Owns Number One". Rolling Stone. Straight Arrow Publishers, Inc. (275): 40. ^ Grease: The Original Soundtrack from the Motion Picture Deluxe Edition. CD liner notes. 2003. Various Artists. Polydor Records. 9809773. Note: Liner notes read under "Greased Lightnin' (Single Version)" that single was issued by RSO in 1978 with catalog number RS909. ^ stugreenfield (2015-12-28). "Top 5 Best Selling Film Soundtracks of All Time". PPcorn. Retrieved 2017-04-02. ^ "John Travolta & Olivia Newton-John - Full Official Chart History". Official Charts Company. Official Charts Company. Retrieved 19 January 2016. ^ "Frankie Valli - Full Official Chart History". Official Charts Company. Official Charts Company. Retrieved 19 January 2016. ^ "Olivia Newton-John - Full Official Chart History". Official Charts Company. Official Charts Company. Retrieved 19 January 2016. ^ a b c "John Travolta - Full Official Chart History". Official Charts Company. Official Charts Company. Retrieved 19 January 2016. ^ Churchill, Michael (23 September 2013). British Albums Chart - All Time Top 1000. London: Lulu.com. p. 105. ISBN 9781291569773. Retrieved 19 January 2016. ^ "BBC Radio 2 - UK's Million Sellers with Tony Blackburn". BBC. ^ "American album certifications – Soundtrack – Grease". Recording Industry Association of America. If necessary, click Advanced, then click Format, then select Album, then click SEARCH. ^ a b Paul Grein (November 21, 2012). "Week Ending Nov. 18, 2012. Albums: Xtina Slips Despite "The Voice"". Chart Watch. Yahoo Music. Retrieved November 21, 2012. ^ "Louis St. Louis". GRAMMY.com. 15 February 2019. Retrieved 18 February 2019. ^ "Grease [The Soundtrack from the Motion Picture]". AllMusic. ^ "Number 1 Albums – 1970s". The Official Charts Company. Archived from the original on 9 February 2008. Retrieved 24 June 2011. ^ "ARIA Catalogue Albums Chart – 03/12/2012". Australian Recording Industry Association. 2012-03-12. Archived from the original on 2012-12-04. Retrieved 2012-03-12. ^ "Canadian album certifications – Various Artists – Grease". Music Canada. ^ Vieira, Guillaume (March 29, 2016). "France best selling albums ever: Grease Soundtrack (1978)". Chart Masters. Retrieved January 9, 2018. ^ "French album certifications – BOF – Grease" (in French). InfoDisc. Select BOF and click OK.
^ "Gold-/Platin-Datenbank (O.S.T. - Various; 'Grease')" (in German). Bundesverband Musikindustrie. ^ "Gold Disc Award 1979". IFPI. Archived from the original on 2012-03-18. Retrieved 2012-08-17. ^ "Gold Disc Award Criteria". IFPI. 2007. Archived from the original on 2007-10-15. Retrieved 2012-08-17. ^ "Italian album certifications – Artisti Vari – Grease" (in Italian). Federazione Industria Musicale Italiana. Retrieved 11 December 2018. Select "2013" in the "Anno" drop-down menu. Select "Grease" in the "Filtra" field. Select "Album e Compilation" under "Sezione". ^ Vieira, Guillaume (August 25, 2016). "CSPC: Grease Popularity Analysis". Chart Masters. Retrieved January 9, 2018. ^ "New Zealand album certifications – Various – Grease Soundtrack". Recorded Music NZ. ^ "Norway Reports". Billboard. 14 July 1979. Retrieved 1 October 2018. ^ "Norwegian album certifications – Various – Grease Soundtrack" (in Norwegian). IFPI Norway. ^ "Spanish album certifications – John Travolta/Olivia Newton-John – Grease Soundtrack" (PDF) (in Spanish). Productores de Música de España. Select album under "Chart", enter 1991 in the field "Year". Select the certification week in the field "Semana". Click on "Search Charts". ^ "The Official Swiss Charts and Music Community: Awards (Soundtrack; 'Grease')". IFPI Switzerland. Hung Medien. ^ Myers, Justin (October 24, 2015). "Quiz: Who sold more?". Official Charts Company. Retrieved October 24, 2015. ^ "British album certifications – Original Soundtrack – Grease - OST". British Phonographic Industry. Select albums in the Format field. Select Platinum in the Certification field. Type Grease - OST in the "Search BPI Awards" field and then press Enter. ^ "Get Your Mind Right: Underground Vs. Mainstream". Cheri Media Group. 2008-02-11. Retrieved 2012-08-01. Grease: You're the One That I Want! "Till You Say You'll Be Mine"
"If You Love Me, Let Me Know"
"Have You Never Been Mellow"
"Every Face Tells a Story"
"Rest Your Love on Me"
"Make a Move on Me"